Our lead, a dapper young lad named Huey, possesses the key to Dalian’s “lock” on the library, leading to hilarious stock footage segments each episode where he “unlocks” her literally, chastity belt style, to retrieve Phantom Books that allow him to nullify the threat unleashed by inadvertent usage of other Phantom Books still loose in the mortal world. We are not given any explanation of how Huey managed to possess the all-important key, but flashbacks indicate that he either knows more about the library that he lets on to Dalian, or is unaware of its true nature when he visited it in the past when he was a child. The first 2 eps pretty much just gets the watcher accustomed to the plot conventions of the show, with Huey and Dalian doing their tag team operations to “fight” the Phantom Book of the Week. The third episode is interesting becauses it deviates from the formula, allowing me to establish a natural break to sum things up. It’s split into two minor stories, and while plotwise nothing much really happens and the action is pretty inconsequential, we get more characterization and the introduction of a “third wheel” character for the duo to play off on. What is obvious is that from this moment on the show hews pretty closely to Gosick in terms of the treatment of its characters. Tsundere Dalian is shown to have a great love of candies and other sweet confectioneries, Huey is the male equivalent of Kujo and Camilla does the Avril act of being a whimsical good natured friend that may or may not have feelings for Huey. Fortunately for the show, everything else is a huge improvement. 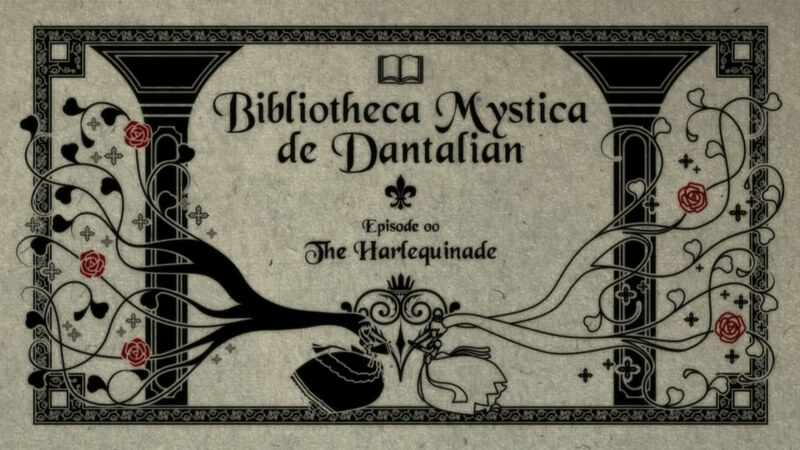 Instead of Scooby Dooby treatment of dark supernatural tales, we have the actual supernatural element in play for Dantalian. The lyrical treatment for drawing out the power and essence of books in each action finale is generally handled well and adds a touch of class to the setpieces, and is a much better concept than trying to play the Sherlockian angle with LAUGHABLY juvenile mystery whodunits. The best improvement over Gosick is really Huey himself. For once the male lead handles himself well in tough situations, is a reasonable shot with a gun, keeps a cool head and generally does whatever an action lead needs to do in a competent fashion. It might not seem like much, but compared to the utter nincompoop and walking plot construct that is Kujo in Gosick, there’s a Herculan contrast. I could really do without the really pointed tsundere act that has Dalian mimicking Victorique, but it’s still not as blatant and her wit does shine through at great moments, like with the Journey to the West gag in the pic above. The OP is fantastic and the soundtrack does its job adequately in conveying gothic ambience, so I have no big issues on the music.